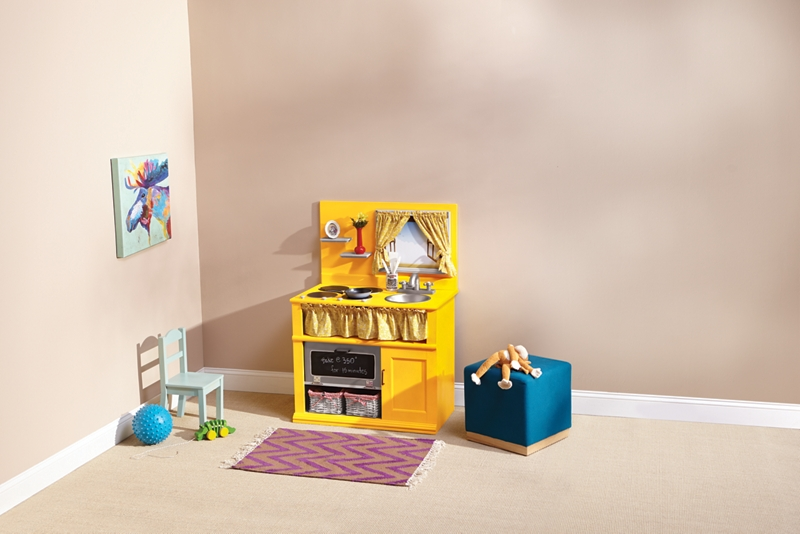 Turn a piece of used furniture into a bright and cheery kitchen play center. Accessories: dishes, tea-towels, flower vase, picture frame, utensils, etc. Prepare furniture piece by cleaning well. Determine where sink will be positioned. Turn “sink” upside down and place in position on top surface; trace around lip of bowl with pencil; remove bowl. Draw a line ¼” - ½” (determined by lip of bowl) inside the traced circle; this will mark your cutting line. With electric drill, make a hole in the center of the circle. Insert jig saw blade into drilled hole and cut circle for sink to sit inside. If shelves are adjustable, secure in place with screws. To make an “oven door”, measure opening of shelf area and cut wood rectangle to fit opening. Determine size for backboard of kitchen unit, by measuring width of cabinet, and calculating the height needed to accommodate the window and shelves. Cut wood rectangle to size. Cut wooden plaque in half to make two sections to be used as shelves. Determine size needed for faucet base, by positioning and measuring knobs and J-Bend PVC piece; cut wood piece to size. Sand surfaces of all wood pieces with medium-grit sand-paper, then again with fine-grit sand-paper. Remove glass, mat, and backing from frame, if necessary. Paint all surfaces of wood pieces with Krylon® Primer; repeat coats if needed for complete coverage. Paint inside surfaces of cabinet, shelves, baskets and frame with Krylon® ColorMaster™ in Pewter Gray; allow to dry completely. With masking paper and tape, mask off inside of cabinet to protect from over-spray. Paint outside of cabinet, and backboard with Krylon® ColorMaster™ in Gloss Sun Yellow; repeat coats to achieve desired coverage. Paint the 6” circles (burners) with Krylon® ColorMaster™ in Satin Black; allow to dry completely. Edge circles with Krylon® Leafing Pen in Silver. Paint front of “oven door” with Krylon® Chalkboard Paint in Black; allow to dry completely. To cover chalk paint on front of oven door, cut a rectangle with rounded corners out of masking paper to fit. Position mask onto oven door front and spray exposed areas with Krylon® Stainless Steel Finish. Once dry, spray backside of oven door with the same paint; allow to dry completely. With a Silver Leafing pen, outline chalkboard area. Mount handles on oven and cupboard doors. Using screws and a screw driver, attach oven door to shelf with hinges. Mount magnetic door hinge to inside top of door and shelf. With Krylon® Stainless Steel Finish, paint faucet, knobs, faucet base, and sink, according to manufacturer's instructions. Using fabric, sewing machine and thread, sew simple gathered curtains and tie-backs to fit window frame and shelf. Mount curtain on shelf with pressure rod. Apply sash rod hardware to window frame; hang curtain and tie-backs. Using metal brackets and screws mount backboard to cabinet. Using screws mount shelves onto backboard. Find desired position, and mount window so it will hang on screws, allowing it to be removed for changing the drawing or scene. Use hot glue to adhere, burners, knobs, sink faucet assembly, and to secure sink in place. Accessorize with play dishes, utensils, decorations, etc.